Flageolet beans are quite wonderful. They’re small and a beautiful mix of white and pale green when dried. Cooked, they hold their shape and color well and smell amazingly wonderful while simmering away on the stove. They have a slightly spicy, very distinctive, very hard-to-describe aroma and taste, that somehow reminds me of Spring. I was lucky enough to receive some Rancho Gordo flageolet beans for Christmas from my friend Christina (the gift that keeps on giving!) and they were just what the doctor ordered after a week filled with too much data analysis and not nearly enough cooking. This dish is simplicity itself: sauté a little onion & garlic, add in sun-dried tomatoes (or in this case, dehydrator-dried tomatoes, but that doesn’t have nearly the caché, no?) and simmer with beans and broth for a few minutes. Hey, presto, a delicious lunch. Or dinner. Or side dish. Or topping for crostini, or base of a salad, or topping for a salad, or… you get the idea. You can do most anything with this, but you must do one thing: eat it. Not your cup of flageolet? See Flageolet and Roasted Garlic Spread or Flageolet Fritters. Reconstitute dried tomatoes in 1 cup of boiling water for 10 minutes until softened (if using tomatoes packed in oil, measure out approximately ½ cup and reserve 1 tsp of the oil). Julienne tomatoes, reserving tomato water. Heat a 12-inch sauté pan over medium-high heat. Add olive oil and heat until shimmering, but not smoking (if oil starts to smoke immediately, your pan is too hot; discard and start again over lower heat). Add onion and sauté until softened and fragrant, about 5 minutes. Add garlic and tomatoes, stir, and sauté until fragrant, another 3 – 5 minutes. Raise heat, add tomato oil (if using) or extra olive oil if necessary; stir-fry beans for 1 – 2 minutes. Lower heat, add salt, pepper, lemon juice, 3 tbsp bean broth and 3 tbsp tomato water (you can subtitute wine, stock or water if necessary). Cover and allow to simmer over medium-low heat until flavors blend, about 5 minutes. Raise heat, remove cover, and reduce sauce slightly. Taste and adjust seasonings. Serve hot or at room temperature. 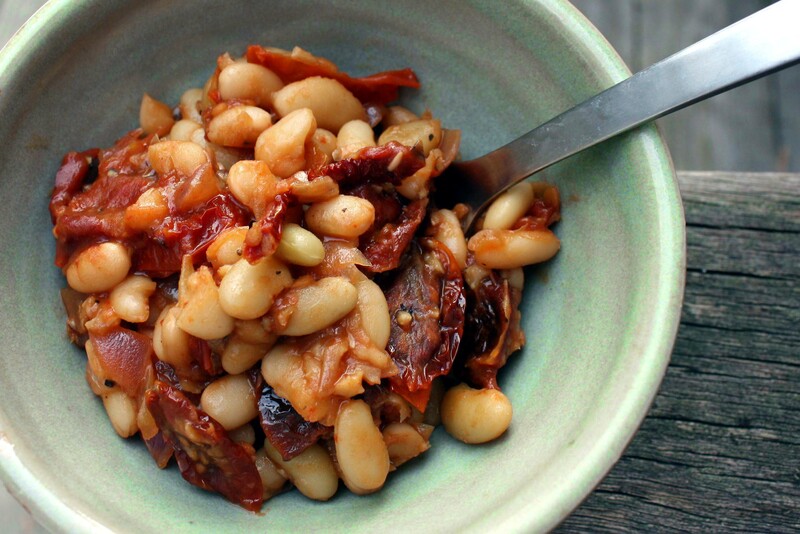 If you cannot source flageolet beans, navy beans are the standard substitute. Cayuga Pure Organics has ’em! But I encourage you to try flageolet beans, even if they are not local to you; their flavor can’t be beat. Rancho Gordo and Bob’s Red Mill have ’em online. For a heartier dish, a little bacon or sausage would go nicely. Saute the vegetables in the pork grease, then add browned meat to the dish at the very end. 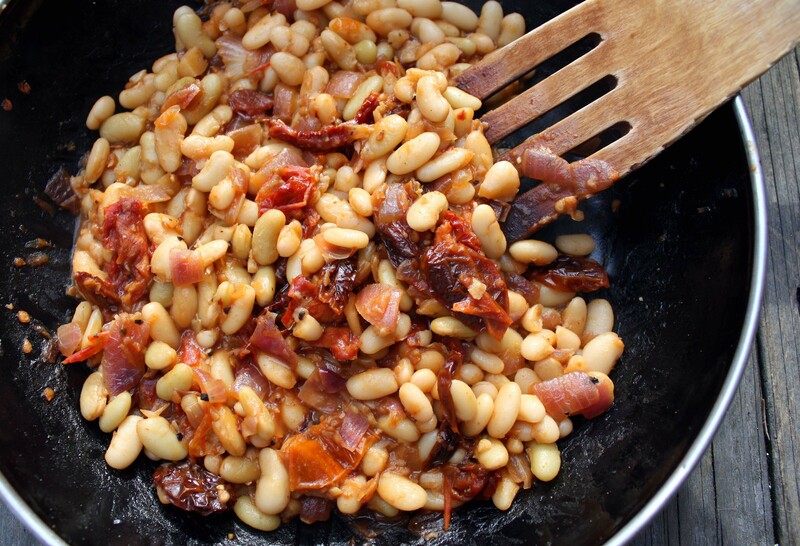 Flageolet beans are classically served with lamb or fish. This dish, with its tomato base, seems like it would go nicely with shellfish; mussels, or scallops or shrimp. Sort of an heirloom bean paella. Resist the urge to over-complicate this simple dish of beans. I added some dried basil to a small amount, and also tried some mint pesto. In the end, I liked it best unadulterated; the flageolet beans are so delicious that too much is just gilding the lily. Like most bean dishes, this should improve for a few days in the refrigerator (assuming it lasts that long). Year round, but somehow this has the flavor of Spring to me. This was actually amazing. I’ve always been meh about flageolets, but they came in my rancho gordo bean club this shipment. Now I “get it”. I’m trying your fritters with the remainder.